For INSEAD, this wisdom is fitting — now more than ever. The school has peaked in a number of different categories this year. The Financial Times awarded INSEAD the no. 1 spot for our full-time MBA, TIEMBA and Global Executive MBA Programmes. Forbes ranked our Programme no. 1 for Return on Investment, as our alumni report the highest net financial gain five years after graduation. We are also the top source of talent for McKinsey, BCG and Bain, and the no. 1 school in Europe for venture capital funds raised by alumni. And the list goes on. In keeping with the proverb, the question that we now face is: How do we continue to climb and take INSEAD to the next level? This is a challenge and an opportunity that we’re addressing from multiple angles. Among the many initiatives we’re focused on, one of our key priorities is strengthening the INSEAD brand. A strong brand is critical to maintaining our competitive edge and attracting the best and brightest students, faculty and staff to INSEAD. Effectively communicating our brand story will play a central role in the success of our forthcoming capital campaign, which in turn will help us fulfil our mission as an institution. This issue of Salamander highlights a few examples of how we are leveraging the power of our community to build the INSEAD brand. From working with alumni to revamping graduation to partnering with faculty to create a ground-breaking space for innovation, here are some of the ways we are working together to share our brand story and perspective on business as a force for good. Creating experiences that are personally meaningful. 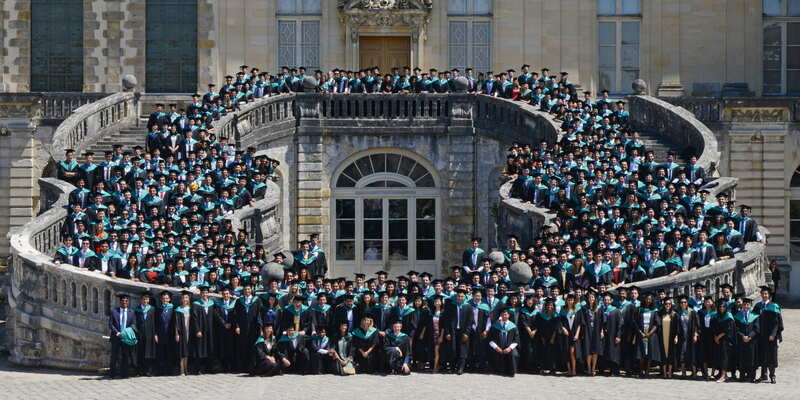 As some of you witnessed last week, INSEAD’s graduation ceremonies have undergone a spectacular makeover. We’ve reimagined these from the ground up, creating an experience that is emotionally meaningful and memorable for all participants. I extend my deepest thanks to Philippe Houzé MBA’74, executive chairman of Galeries Lafayette Group, who generously sponsored the ceremonies and provided invaluable counsel during the redesign process. Do take a moment to read our interview with Philippe in this issue, as he explains his inspirations for the event and vision for the INSEAD brand. As you’ll read in the article, “Woven in our fabric: Scottish alumni present INSEAD tartan,” in June our Scottish alumni historically commissioned the creation of a kilt and INSEAD tartan in celebration of INSEAD’s no. 1 Financial Times ranking. It was a great honour for me to accept the kilt and tartan during our Alumni Forum in London. I hope to see more alumni proudly wearing this beautiful tapestry of green, red and gold in the years to come. “Quality has a price”, to quote Andreas Jacobs MBA’90D, chairman of the board of directors at INSEAD. In other words, INSEAD needs resources to meet and exceed the great expectations we’ve set for ourselves; we need financial support in order to serve as a top business school and shape our students into global leaders who can address the world’s greatest challenges. Hence, as Andreas explains in his editorial, INSEAD’s board recently approved the appointment of Rémy Best MBA’93D to chair a future capital campaign (currently in the planning stage). In addition to sharing his personal reasons for giving back to INSEAD, Andreas explains why fundraising plays such an instrumental role in our future as a global institution. Building state-of-the-art environments that support innovation. As you’ll read in the article, “A space to create,” the Singapore Campus recently unveiled a new space called the “Creative Garage.” Part classroom, part workshop and part research centre, the Creative Garage is designed and designated for all types of creative activities at INSEAD. As Professor Manuel Sosa shares, it’s already producing exciting results and positioning INSEAD as a leading business school for entrepreneurship, innovation and creativity. Our sincerest gratitude to Gary Wang MBA’02J and Heinrich Baumann MBA’72, who generously funded the development of this project. Empowering alumni to strengthen and extend our brand. We’ve just concluded two excellent Alumni Forums in New York and London, where alumni and friends gathered to discuss INSEAD’s role in the future of business, strategies for fulfilling our mission of using business as a force for good, and the importance of branding at this particular juncture. I’m excited to share that we have another upcoming forum scheduled in Singapore from 18 – 20 November. Also, do take a moment to review the article from the Canadian National Alumni Association about their activities and their plans for the Americas Forum 2017. This issue also features an article from the INSEAD Alumni Association about the Alumni Volunteers Meeting. Strengthening the INSEAD brand is a joint effort that depends on active participation from our entire community. This is consistent with our 55-year history, as we could not have achieved such success without the innovation and dedication of many colleagues, alumni and friends. It is only through working together that we have become a truly independent and entrepreneurial business school with a distinct mission, unmatched global outreach and unparalleled diversity. I encourage all of you — our esteemed graduates — to consider how you might contribute to strengthening the INSEAD brand. This could take many different forms: you could tell a colleague about your experience as a student, share a story about a fellow graduate, invest in INSEAD by making a gift or you could even wear the INSEAD tartan. Such actions add up, especially when you consider that we have more than 50,000 alumni across 172 countries. Imagine the incredible power of INSEAD’s influence and impact if each of us played a part.